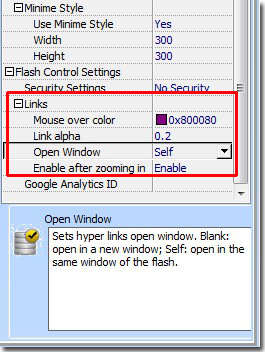 Q: Can I open the link that inserted into the flash book in a new blank window? When I am reading the flash flip book, I find that there are some links. Then I want to know more details about the book sometimes. But when I click the link it always open in the same window of the flash book. I really want to do some change to make it open in a new window. What can I do about this? It is your right to define the links properties according to needs. Just follow the below tips to get some help. Step1: find the “Links” group in the right design setting panel. 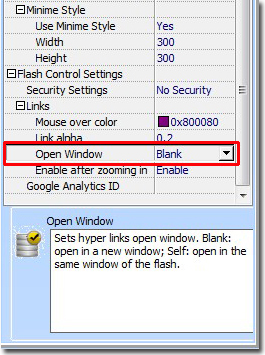 Step2: transfer “Self” to “Blank” of the “Open Window” as below.